The Hallmark Channel continues to produce wonderful original movies that I enjoy watching. One of my favorites is The Note, the hugely popular movie based on a book by Angela Hunt about a newspaper columnist named Peyton McGruder that comes across a note while visiting an airplane crash site and finds her life forever changed. 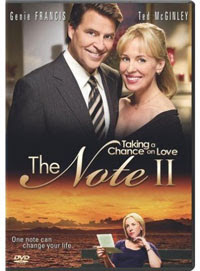 On Tuesday, May 5, 2009 the sequel called The Note II: Taking a Chance on Love arrives on DVD. Yes, please do take a chance on love! Newspaper columnist Payton (Genie Francis) and sports editor King (Ted McGinley) return in The Note II as dating co-workers but struggle as personal and parenting issues get in the way of their relationship. After receiving an eye-opening note from one of her readers named Eve Miller, Peyton the "Heart Healer" eventually learns that sometimes you need to trust your heart and let go of your fears when it comes to love. She meets Eve and finds herself immersed in deep conversations involving love and risks. As a result, they both look back on their lives and face their unresolved relationship issues with renewed hearts and minds. Throughout the movie Peyton also works to strengthen her relationship with Christine (Katie Boland), the daughter she gave up eighteen years earlier. The movie is really about two different love stories (Peyton's and Eve's) from two different time periods. Through the use of flashbacks, viewers learn of Eve's first real love and decisions she was forced to make in the 1960's. Viewers also discover the reason for Payton's problems with commitment. I especially enjoyed Eve's life story. While I can't say that I found the ending particularly surprising, the heartwarming DVD is certainly worth watching if you are a romance movie fan. By the way, here's a Mother's Day special alert! The Note will be airing on the Hallmark Channel on Sunday, May 10th at 10:00 AM CT and 6:00 PM CT.
Great review! It sounds like a good movie! Thanks for sharing. Just to let you know, you were one of the two winners for my children's book giveaway. Please email me your mailing info so I can get the book out to you next week!